The 2018 North Atlantic Heath Sciences Libraries (NAHSL) annual conference in Manchester, NH, was a showcase of its members’ continuing excellence in hospital and academic health sciences librarianship, as well as a celebration of the organization’s 60th anniversary. NAHSL’s 2018 theme, “Remaining Strong in an Ever-Changing Landscape,” draws from granite as a representation of strength and durability, New Hampshire as the “Granite State,” and diamonds as a traditional 60th anniversary gift. 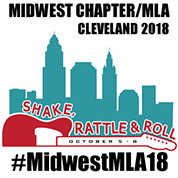 This theme carried over through the plenary speaker presentations, the MLA update, and the selected posters, lightning talks, and contributed papers to demonstrate how our members have remained strong and endured as health information and information needs change over time. This year, the organization was pleased to introduce a handful of new elements to the annual conference, including enabling credit card payments for the scholarship table through a tablet and kick-starting online conference proceedings. Moreover, in conjunction with MLA’s new initiatives related to diversity and inclusion, the NAHSL Conference Planning Committee and Executive Board developed its inaugural meeting code of conduct, which recognizes the importance of providing a safe, inclusive, and welcoming space for all of our attendees, vendors, and venue staff. NAHSL was incredibly honored to host two stellar plenary speakers at the 2018 conference: Paul LeBlanc, president of Southern New Hampshire University, and Manoush Zomorodi, the podcast host of ZigZag and the author of Bored and Brilliant: How Spacing Out Can Unlock Your Most Creative Self. LeBlanc spoke about adapting to changing needs in higher education and the significance of adopting disruptive innovation to meet those needs. Zomorodi discussed the transformative power of technology use, for better or for worse, on human behavior and information security. We were also privileged to have MLA President-Elect Julia Esparza, AHIP, deliver an invigorating update on MLA news and end with a passionate call for membership engagement and involvement in the national organization. To kick off the 2018 conference, members attended the welcome reception at Manchester’s Millyard Museum, which featured a local exhibit about Manchester history that included stories of its native peoples, farmers, lumbermen, and immigrants; the development of the textile industry; and the growth of local businesses into the 20th century. Members also enjoyed a 1960s-themed banquet to celebrate NAHSL’s 60th anniversary, complete with a live DJ, a ’60s costume contest, a 60/40 scholarship raffle drawing, and an ice cream bar. Throughout NAHSL’s 60-year history, members have pointed to the lightning talks, contributed papers, and poster sessions as highlights of the conference, and this year was no exception. Members presented on a wide variety of innovative as well as practical topics, such as hosting gaming in libraries, creating effective library tutorials, marketing outside of the library, teaching professional skills to medical and dental students, building a library carpentries consortium, assessing rural school nurse health information needs and barriers, helping students fight procrastination in the week before finals, and many more. For the first time, we were able to capture this content and make it available to all NAHSL members through the launch of our conference proceedings website. This collection, in collaboration with the Lamar Soutter Library and hosted by the eScholarship@UMMS Repository at the University of Massachusetts Medical School, allows presenters to submit their conference proceedings online in a matter of minutes. As this collection grows in the future, it will showcase the talent of all NAHSL members. The 2018 NAHSL annual conference could not have been possible without the generous contributions and involvement of its members, Executive Board, and Conference Planning Committee. Collectively, everyone’s efforts underscored NAHSL’s capacity for endurance and cooperation, and facilitated the planning and execution of a tremendous celebration. Moving forward, NAHSL plans to sustain a biennial rotation between a one-day conference and a traditional three-day conference in order to increase conference attendance and remain budget conscious. We invite anyone who is interested in the one-day format to come to Springfield, MA, next October!